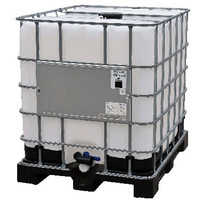 The Light Duty IBC is a composite IBC designed for the transportation and storage of liquids. It is UN Group II approved. The liner is blow moulded from HDPE, providing resistance to chemical corrosion. The specialised cage provides superior protection in service and flexes more efficiently than tubular steel alternatives. This unit also has the benefit of having the same external dimension to other leading brands, allowing direct replacement for other manufacturer’s light duty IBCs. Before use, every Light Duty IBC should be inspected to ensure that it is free from corrosion or damage. Any Light Duty IBC which shows signs of reduced strength compared with the tested design type should no longer be used or should be repaired so that it is able to withstand the design type tests. Please complete the form below if you would like to enquire about the Light Duty IBC.